Home of Queen of the Breed II Runner-Up Dellia and breeders of Durham, Dundee and many more! Regancrest Farms is known worldwide for home to industry leading genetics. Many Regancrest families are creating industry buzz but none currently like the Barbies with 17 ranked among the Top 100 of the breed for TYPE! Top GTPI Cows in the U.S.
Regan-Danhof Jedi Cashmere scores VG-88 EX-MS @ 2-07. Cashmere herself is still one of the highest Jedi daughters in the breed scoring over +2800G and nearly 3 points on type! Her dam is a high-scoring Jacey granddaughter of LARCREST CRIMSON! Cashmere herself is proving to be a very valuable transmitter with already sons at Genex (GAMECHANGER), Semex (COPYRIGHT), AI Total (CASE) and other European studs with more to come! 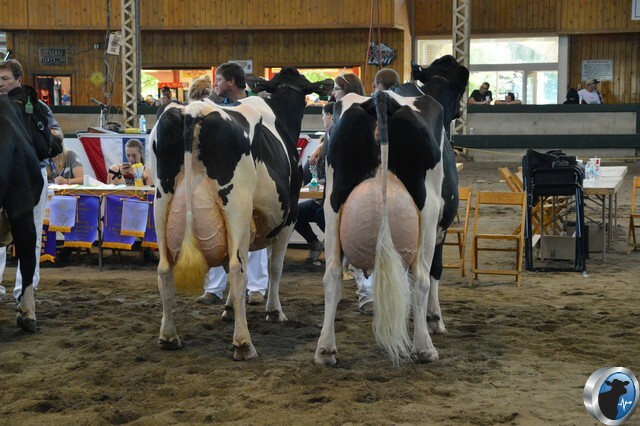 Regancrest Farm successes at the 2018 Iowa State Fair Holstein Show... Regancrest D Bombshell 3rd Place Sr. 2-Yr-Old, Sunview Racer Hugo EX-90 2nd Place Sr. 3-Yr-Old, Regancrest-GV Frd Bali EX-92 2nd Place Lifetime Production Cow and Regancrest Dorcy Ilana EX-91 3rd Place Lifetime Production Cow. Exciting day for Regancrest Farm... 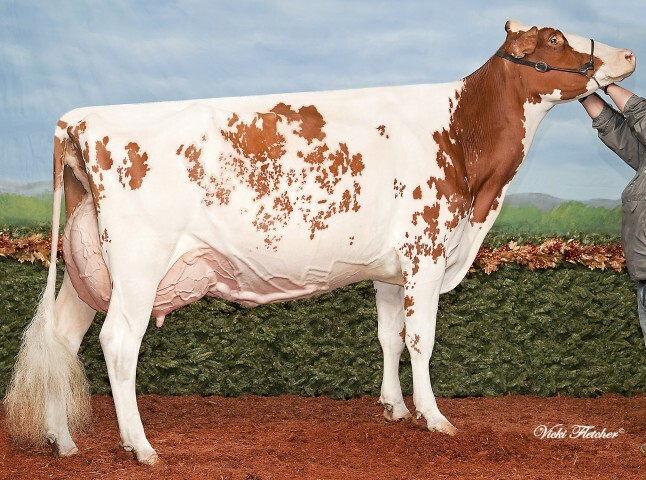 Seven females directly out of Regan-Danhof Jedi Cashmere scored over 2800 GTPI on today's New Genomic Females list. Cashmere is the +2898 GTPI Jedi daughter backed by the Cosmopolitans. OCD Jacey 2421 was recently scored VG-88 EX-MS at 2-08, this exciting young cow is a Jacey daughter of Larcrest Cologne EX-90 (Robust x Larcrest Crimson). 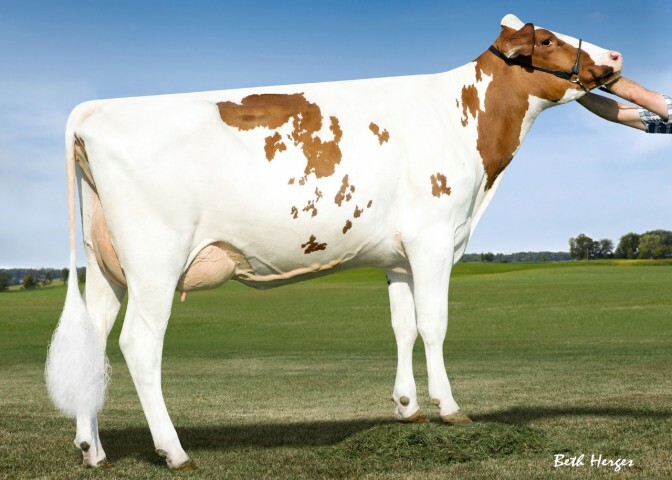 Jacey 2421 already has several high ranking offspring including Regan-Danhof Jedi Cashmere GTPI+2935 who is one of the highest GTPI females in the world! Selling in the Hammer Time at Heritage Sale is a beautiful RED Integral fall calf from Milksource LD Shania-Red VG-88-2YR, next dam the EX-97 2E Grand and Supreme Champion SEISME! Tremendous offering, bid last on Lot 19. Three exciting consignments by Butlerview Farm, Regancrest Farm and Duckett Holsteins out of the Regancrest-PR Barbie family. Selling are a Fever daughter direclty out of Chassity, a Windbrook grand daughter of the one and only BARBIE and a September 2014 Doorman calf from Sandy-Valley Atwd Brandy EX-91! Don't miss these fancy calves and add a family member of the fantastic transmitting Barbies to your herd. Both heifers sell in the Quest for Success Sale II Friday March 27, 2015. Lot 8 Ms Chassitys Forever | Fever calf directly out of Regancrest S Chassity EX-92 GMD DOM... Maternal sister to Gold Chip & Colt 45! Lot 9 Regancrest-MVM Brooke | Windbrook x EX-90 DOM Goldwyn x Regancrest-PR Barbie EX-92 GMD DOM! 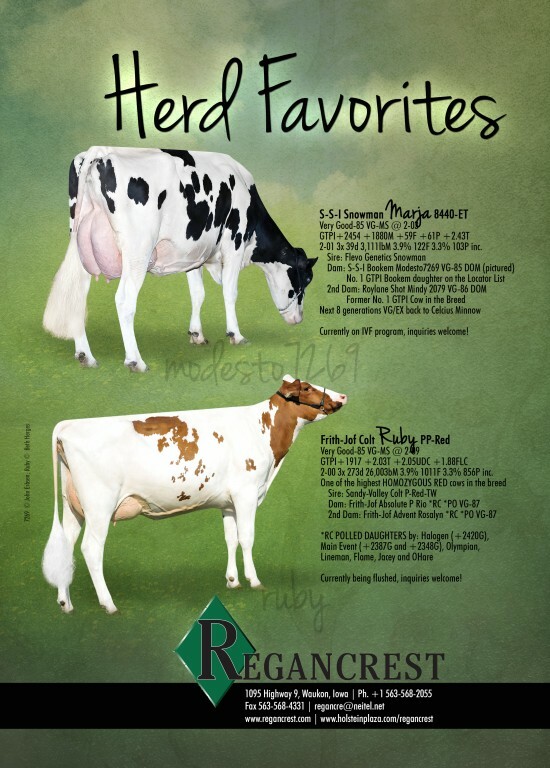 Selling in the Airosa Dairy Extravaganza Sale on Thursday, Feb. 15 from Regancrest is a unique *RC *PO Halogen with a +2296 GTPI and over 2 points on type! Dam is the NOW Very Good Frith-Jof Colt Ruby PP-Red. Regancrest Farm had a great B&W Show yesterday at the Minnesota State Fair. Tande Atwood Popsie (1st Sr 2-Yr-Old) was Res. Intermediate Champion. CLICK HERE to read more highlights. 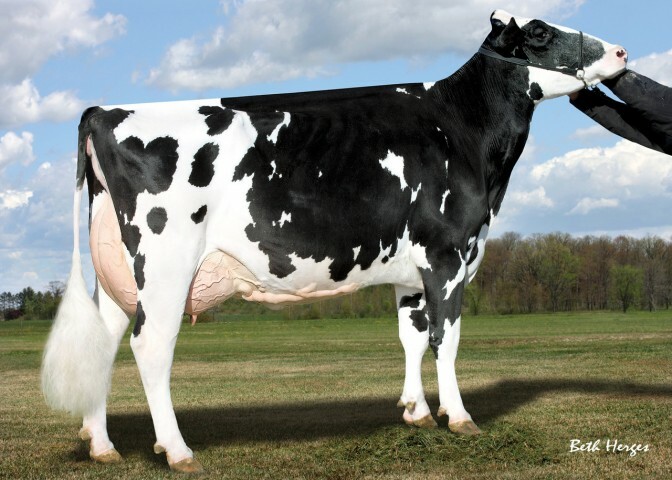 One of the sires that did really well during the last index proof run was Regancrest altaIota, bred by Holstein Plaza members Regancrest Farm. After adding many new daughters to his proof Iota climed to a TPI lever of +2214. 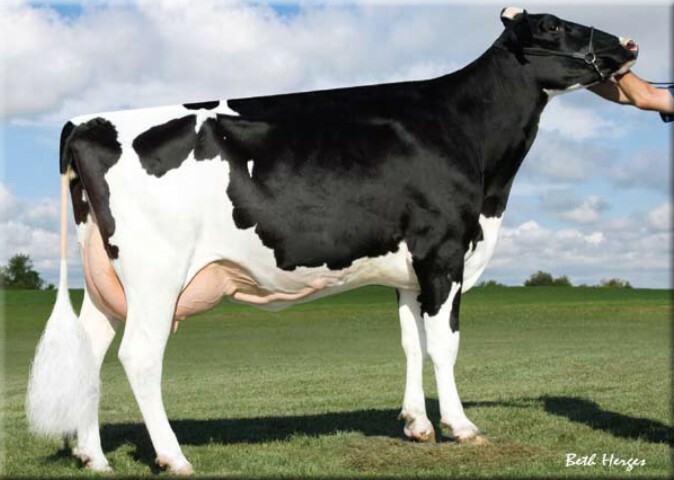 Several Holstein Plaza members are working with great Iota daughters like Ms Welcome Iota Tacey VG-87-2YR. #1 Polled Predestine from Opine Sells! Selling as Lot 54 is the #1 Polled Predestine from Hickorymea Manoman Opine-P VG-87-3YR. Regancrest Opines 7456-ET scores GTPI+2337, NM$715 and 2.88T, her dam Opine-P is one of the highest scored GTPI polled cows in the breed. Jason Danhof from Waukon, Iowa, has been awarded the A.C. "Whitie" Thomson Memorial Award at World Dairy Expo for his great leadership and sportmanships troughout shows. Congratulations! 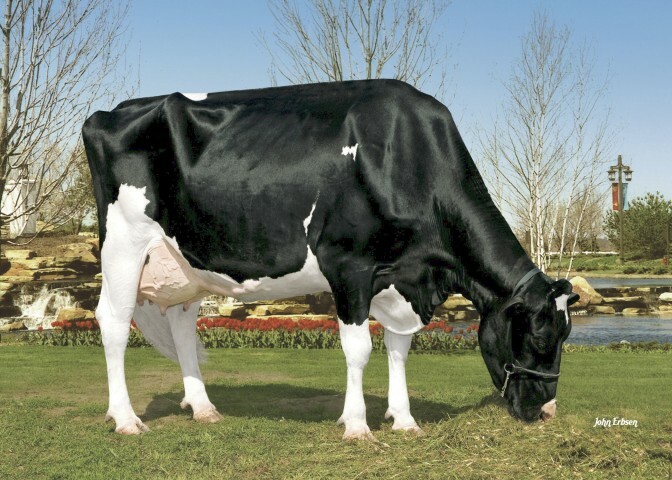 Regancrest S Byesha-ET EX-91 | Beautifull Sanchez daughter from the BARBIES! Scoring GTPI+1998 +3.98T and is succesfull on the SHOWS! Regancrest had a great classification recenlty. In total there were 33 new VG cows including 19 VG-2 Year olds, 3 new Excellents and 4 cows were raised Excellent. #1 PTAT Female in the U.S. now VG-87 and from the Barbies! Regancrest Sanchez Blair the #1 PTAT Female in the U.S. is now Very Good-87 87-MS at 2-09. 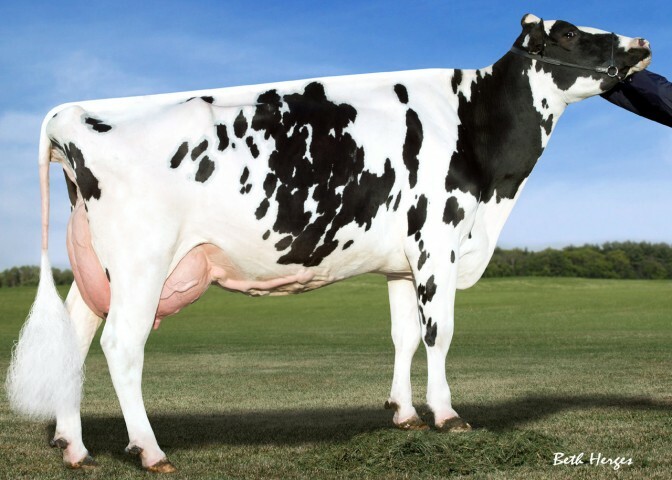 Blair has a PTAT of +4.84 and is the daughter of Regancrest Shottle Belara EX-94 DOM (Shottle x Barbie)! #1 PTAT Cow NOW EX-92! 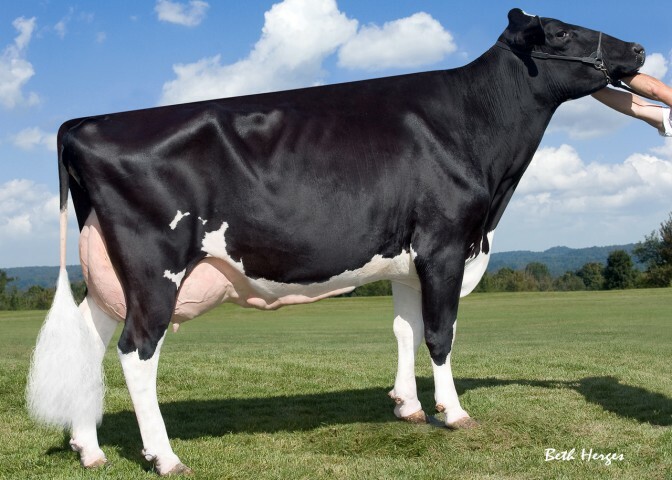 Regancrest MB Breauna-ET (Mr Burns x Shottle Breya x Durham Barbie) is now Excellent-92 92-MS at 4-09 and has held on to the top position as the #1 PTAT Cow on the Locator List for the past five proof runs. 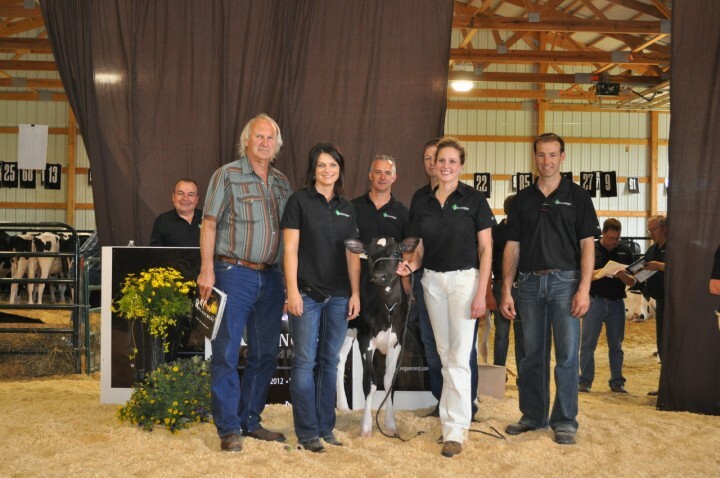 CONGRATULATIONS to Regancrest Farm for the distinguished honor of 2012 Holstein Association USA Elite Breeder. 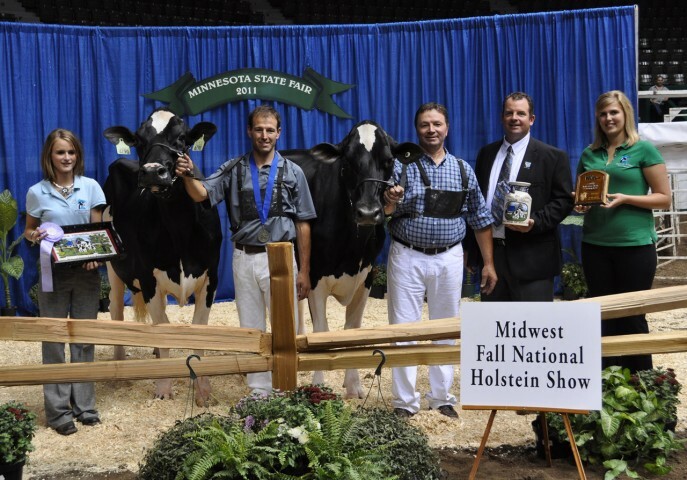 One of the most influential herds to the Holstein breed, Regancrest Farm is recognized worldwide for it's outstanding genetics ... click here to watch video highlighting Regancrest Farm prepared by Holstein Association USA. Congratulations again to the Regan Family. The #1 GTPI Observer at +2487G and +4.01T sells as Lot 14 on the National Convention Sale this Friday, June 29 in Springfield, MO! Dam is Mac Benisha VG-87 followed by Shottle Breesha then Durham Barbie! 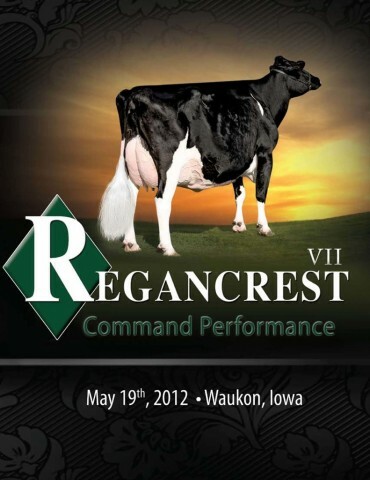 Regancrest Command Performance VII averages $12,207! 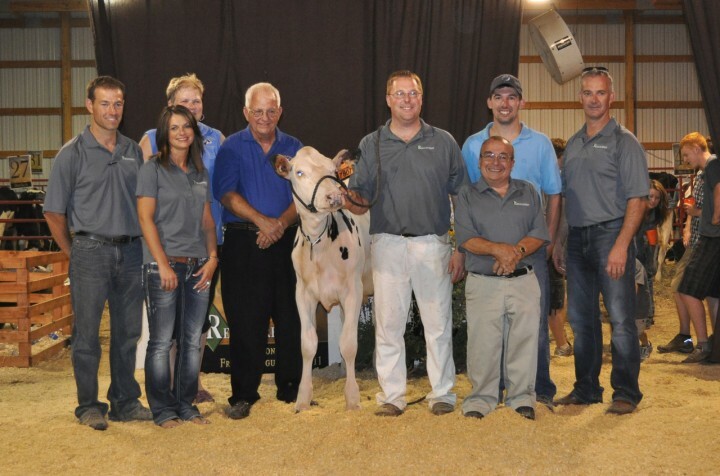 Congratulations to the Regan family on another tremendous Regancrest Command Performance Sale. High seller of the day was Lot 1 and Lot 14 both selling for $60,000! Lot 1 was the +2562 GTPI Shamrock daughter of Sebastian Aruba and the Chief Adeen family, she is also the current #1 GLPI Shamrock. Shamrock Amber was the consignment of WIlliam and Daniel Langreck of West Union, Iowa and was purchased by Jeff Butler, Chebanse, Illinois. Lot 14 was the first choice Supersire from Larcrest Cale, the +2409 GTPI Observer daughter of Crimson and sold for $60,000 to Mark Kerndt, Waukon, Iowa and was a consignment from Larcrest Holsteins. Lot 22 was the third high selling lot of the day and a +2429 GTPI Shamrock from Regan-ALH Boliver Divina VG-87-2YR. She was consigned by Sandy Valley Farms and purchased by Jeff Simpson, Illinois. Sale Updates and Order for tomorrow's Regancrest Sale! 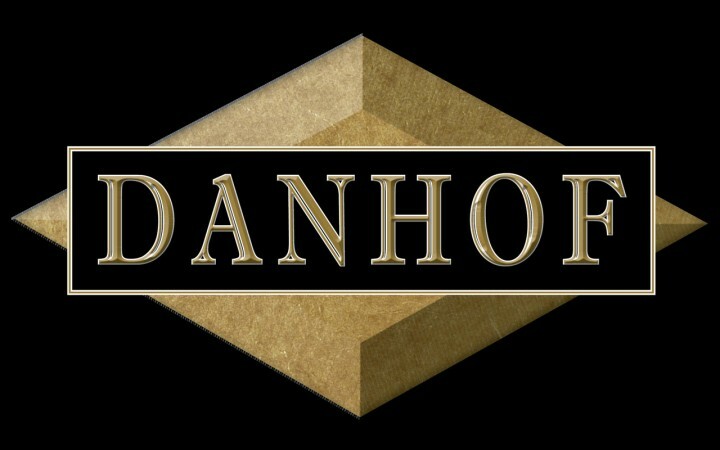 The Regancrest Command Performance Sale VII will be held tomorrow 10:30 a.m. (CST) at Jason and Sheri Danhof's just past the farm... don't miss this tremendous lineup! The Regancrest Command Performance Sale VII will be held this Saturday, May 19 and if you haven't check out the tremendous lineup please do so now by clicking here! 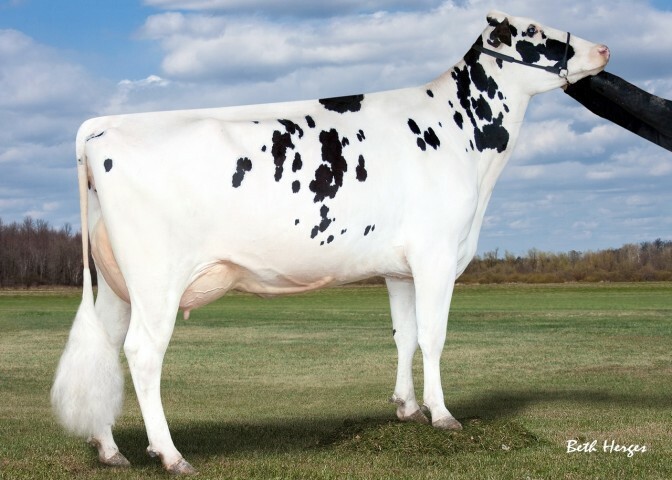 Selling tonight in the Prairie Classic National Convention Sale in Brandon, Manitoba is a +2157 GTPI Snowman from EX-94 GMD DOM Barbara, the great Shottle from Barbie! Following a visit from the classifier, Regancrest Farm is excited to announced 32 new Very Good Two-Year-Olds and nine new Excellents with 46 other new Very Goods in the herd. Click here for results! 1st Choice x Goldwyn Gali... from the Marbellas! 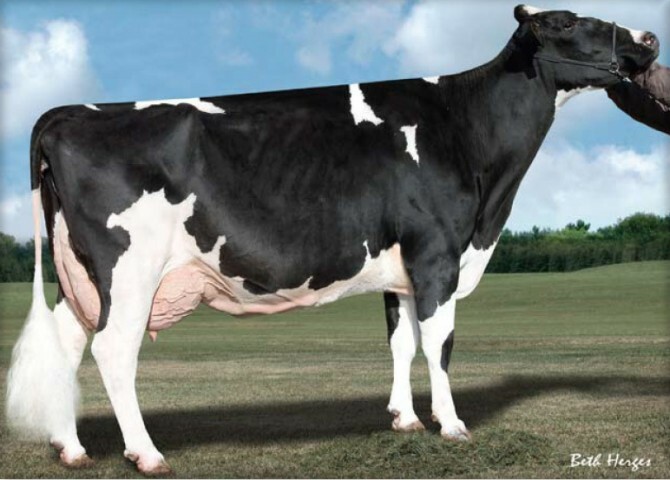 1st Choice Female (Facebook, Cameron, Numero Uno, Supersonic or Epic) from Goldwyn Gali VG-88-2YR GTPI+2137! Next dam is S Marbella... global demand from this huge genomic family! Lot 50: Observer heifers are impressing breeders everywhere, and this one is no exception. With a GTPI of +2238, this December 2010 born calf is from Rabur S Padora-ET VG-86, the heavily contracted Shottle daughter who already has 8 sons in A.I. 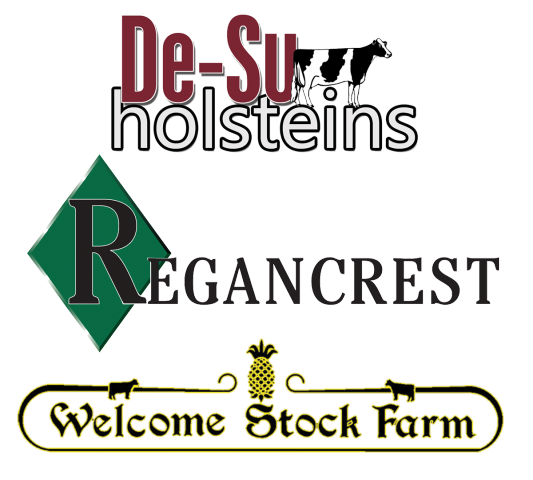 Regancrest Farms are putting Regancrest O Pacifica-ET on the open market – a new family creating waves! Click here or visit the Video tab for footage from the selection of champions! 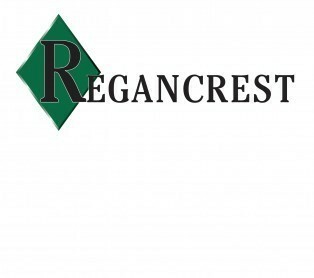 Congratulations Regancrest on a successful Summer Event Sale! The 2011 Regancrest Summer Event Sale will go down in the books as a success. Once again the elite crew at Regancrest put together an exceptional line-up representing the best of Regancrest and special guest consignments. The sale concluded with an average of $13,957. The high seller of the evening at $87,000 was Lot 3, B&Z Planet 7807-ET, this extreme Planet has a GTPI+2448 and sold with bull and embryos contracts to Dairy Elite Genomics LLC. Second high seller at $42,000 was Lot 16 the +2453 GTPI Russell daughter +304 above Parent Average and from a VG-87 Auden from the Saturday family. Lot 12, Tranquility AC Drearys Wild-ET, was the third high seller of the evening at $37,000. Wild is a Bookem daughter of Ronelee Boliver Dreary-ET VG-86-2YR with a GTPI+2397 +792NM$ +7.4PL. She also sold with bull and embryo contracts. Click here for more selling prices and sale catalog! Click here for the latest version of sale updates for today's Regancrest Summer Select Sale! Updates for Regancrest Summer Select Sale now online! The Sale Updates and Sale Order for tomorrow's Regancrest Summer Select Sale are now online! Attention travelers.... the MAIN bridge is closed crossing from Hwy 35 Wisconsin to Lansing Iowa to take Hwy 9 to Regancrest Summer Select Sale. This will cause problems for travelers. Options to cross are now at LaCrosse, Wisconsin or Prairie du Chien, Wisconsin. Only three days from the 2011 Regancrest Summer Select Sale featuring the best of Regancrest and special guest consignments. Click here for the online catalog! 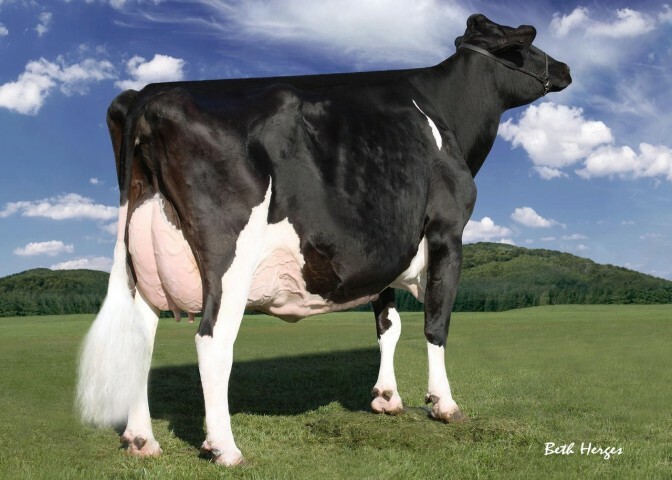 • +2348 GTPI Freddie daughter of Gold-N-Oaks Arabell VG-88 DOM GTPI+2197. 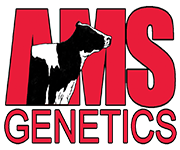 The Top 25 PTAT Cows and the Top 25 PTAT Heifer lists have been posted on under the Top Genomics tab. Leading the way once again are the Barbies with nine heifers in the top 25 and eight cows in the top 25! Regancrest sells 1st Choice Female from Breeds #1 Type Family! Selling on the National Convention Sale tomorrow, June 24 is the 1st Choice Palermo from Regancrest Breya-ET VG-88 DOM PTAT +4.28! Breya is a full sister to the #1 proven type sire, Braxton and Breya's Mr Burns daughter is currently the #1 PTAT Female in the United States PTAT +4.43. Regancrest Farms sends a 1st Choice Gold Chip to the Memorial Day Sale. 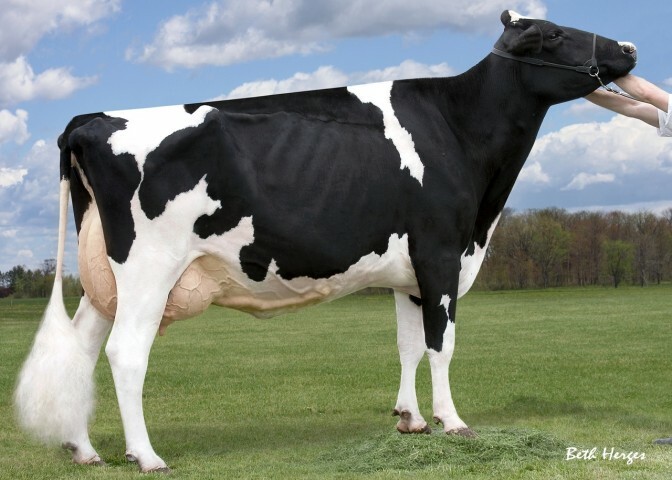 Dam is +2355 Man-0-Man x EX-90 Jose x EX-91 DOM Boliver Tab! It was a very successful classification day for Regancrest Farms with 16 NEW Very Good Two-Year-Olds and 9 NEW Excellent Cows. Congratulations to Regancrest Farms, breeder of Regancrest-PR Barbie-ET EX-92. Twelve Barbies landed in the Top 25 PTAT for April 2011 (from locator list). 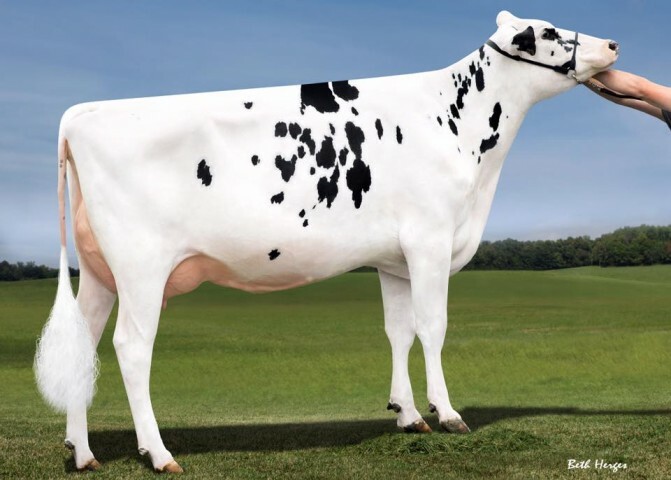 Selling this Saturday at the Milksource Main Event from Regancrest Farms is the #2 GTPI Dorcy daughter at GTPI+2300 from a VG-86-2YR Shottle x EX-91 3E Outside Pandora. - 1st Choice (sire to be announced) from Ms Regancrest MS Tanya-ET GTPI+2233. Tanya is a fancy outcross Man-O-Man with loads of potential from the Bolvr Tab family!